Many types of agencies provide educational services to ABE students in California. You may work or volunteer for an adult school run by a local school district, a community college, a library literacy program, a correctional facility, a county office of education, a community, or a faith-based organization. You will want answers to the following questions before you begin your teaching assignment. 1. What do I need to know about my classroom? What about the school site? Where is my classroom? Is it locked? If so, who will open it? What hours and days will the classes be held? Will I work evenings or Saturdays? Is there an instructional aide to help in the classroom? Is the room furnished appropriately for adults? Who is the agency contact person? Where are the restrooms? Are they always open? Is there another teacher on site? Is there access to clerical staff and audio-visual and copier equipment on site? Are the students allowed to have food and/or drinks in the classroom? 2. What routine procedures at my teaching site do I need to know? What’s the procedure for being paid? How do I handle student attendance? What forms are required and to whom do I submit them? Is there a minimum and/or maximum number of students required for my class? How do I request substitute teachers? What is the instructional calendar? How do I obtain professional development? 3. How are students registered and placed in my class? Your agency may have a formal process to register new students. If so, when students enter your class, they will have completed an intake form and possibly a placement test to determine their level of basic skills proficiency. Some agencies, however, require that the teacher conduct the registration and placement process with new students. Ask your supervisor about your responsibilities in this area and about the forms, tests, and other resources that are available to you. 4. What is the level of the class I will be teaching? The California Department of Education publishes the Model Standards for Adult Basic Education Programs. This publication defines three levels of proficiency: Beginning, Intermediate, and Advanced for math, reading, writing, speaking, and listening. If all your students fall into just one of these levels, you will be teaching a single-level class. This occurs most frequently in mid- or large-size agencies where there are several different levels of classes. It is common practice in smaller programs to place students of several proficiency levels into one class; this type of class is designated a "multilevel" class. 5. How do I assess my students’ needs? Adults have many reasons for wanting to improve their literacy skills, but for many students, the goal is to obtain a high school diploma or a GED credential. Your agency may assess students during the intake process, or you may be expected to administer your own assessment. For more information refer to the Accountability and Assessment page. 6. How can I help my students to set realistic goals? Students who enter an adult literacy program often have had negative experiences, including failures, in traditional educational settings. As a result, they are apprehensive about returning to school and they lack confidence in their ability to succeed. You can help them overcome this anxiety by encouraging them to set realistic short- and long-term goals. An initial interview with each student can identify his/her strengths and areas needing improvement as well as the goal(s) that prompted him/her to seek help through ABE classes. The interview should provide you information about the learner’s educational history; daily involvement in literacy activities; educational, employment, family, and community involvement goals; and a discussion of work or family commitments that may affect attendance. 7. What is the core curriculum and what books and materials will be available to my students and me? Your site supervisor or program administrator most likely will provide you with the core curriculum for the class you will be teaching. In addition, the Model Program Standards for Adult Basic Education lists the math and language arts objectives that are appropriate for each instructional level. Sample course outlines also are available on the Outreach and Technical Assistance Network (OTAN) Web site at http://www.otan.us. To access material for classroom use, sign in to the OTAN Web site and enter the key words "sample course outline" in the search box. Your site supervisor will provide textbooks and other supplemental materials useful in teaching ABE. These may include visuals, real-life objects, video programs, audio-visual equipment, computers, etc. For a list of instructional materials appropriate for certain topics and levels, see the Quick Search Materials. 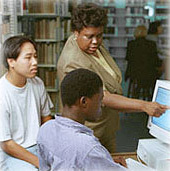 Click on "Curriculum and Resources" on the California Adult Student Assessment System (CASAS) Web site at http://www.casas.org.